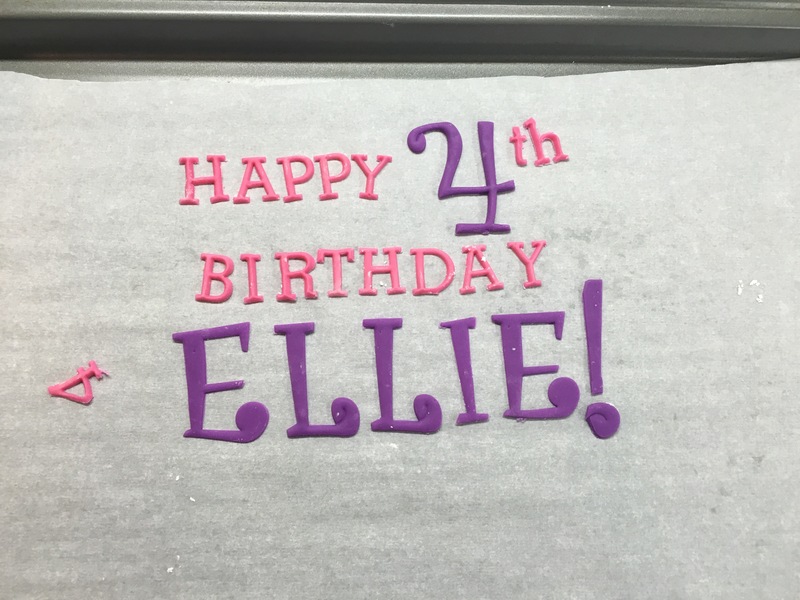 I can’t believe it’s time for Ellie’s birthday again! 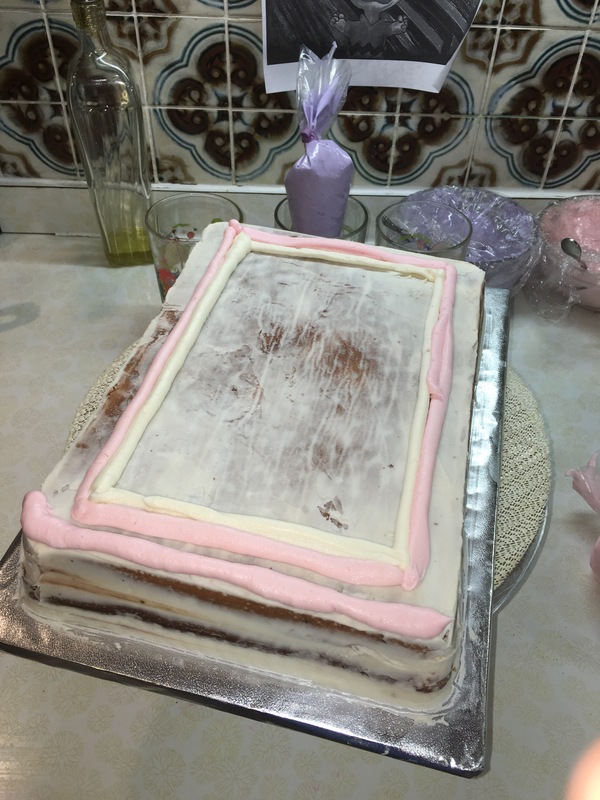 I have been making her birthday cakes since she was one year old. 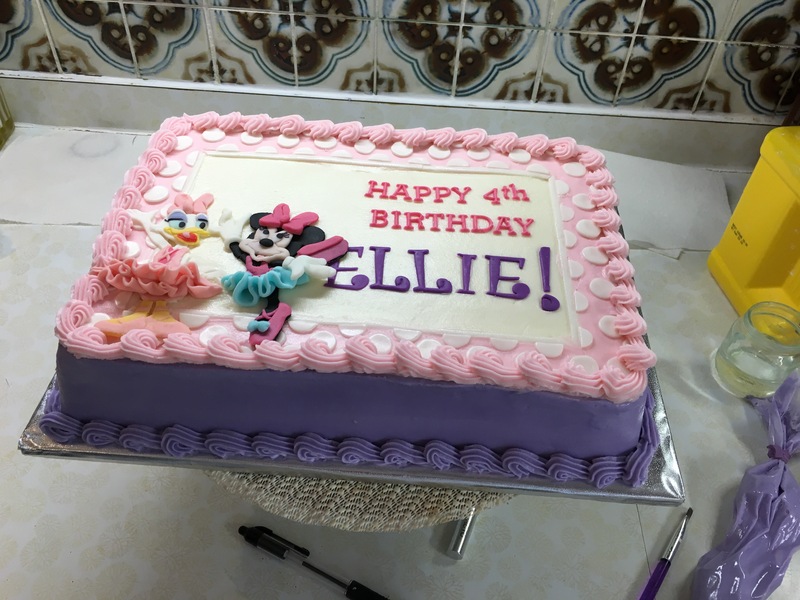 Last year I made her a Minnie Mouse cake using a Wilton Mickey pan, and it turned out so great! 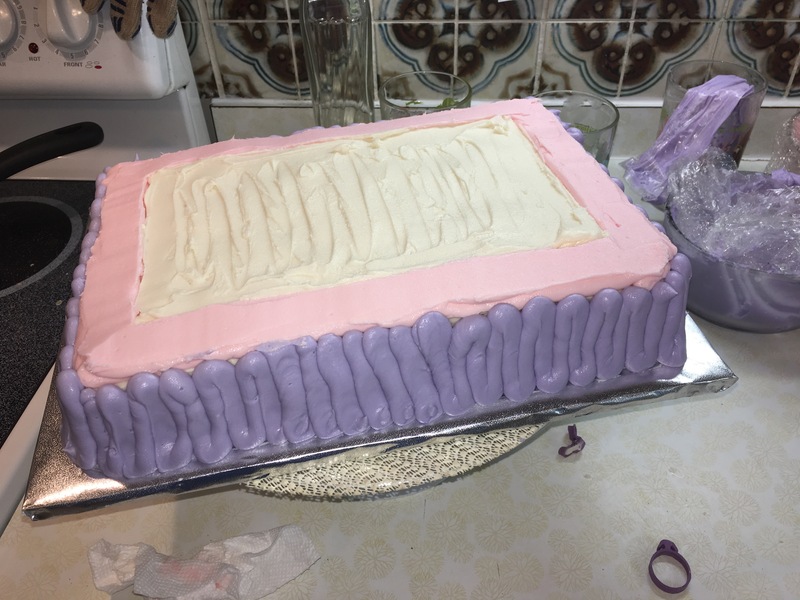 This year, I have been making a lot of sheet cakes and people are starting to take notice. So her mom, Rachel, wanted to try that this year. Something with Minnie and Daisy as ballerinas. She also showed me a picture of Ellie’s favorite Minnie Mouse toy for guidance on her outfit. 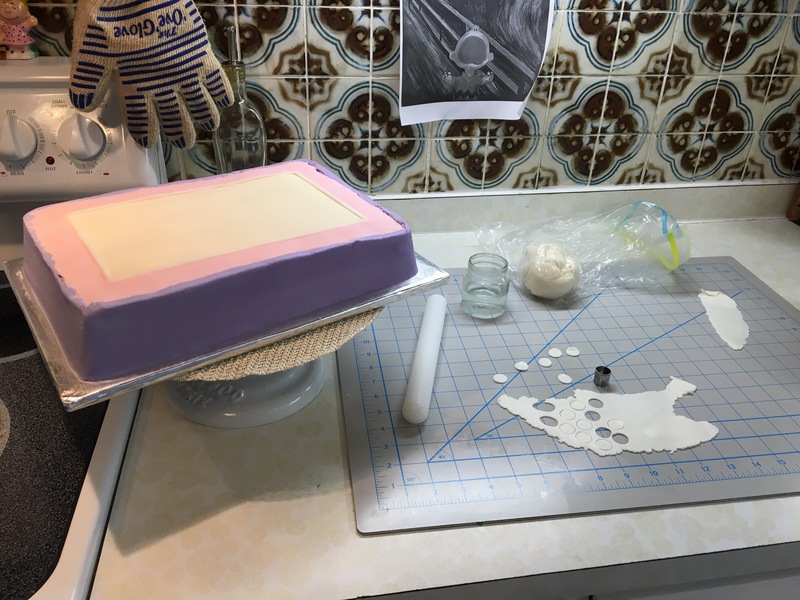 What I really want to focus on in this blog post is how I made the buttercream portion of my cake and how it all came together. 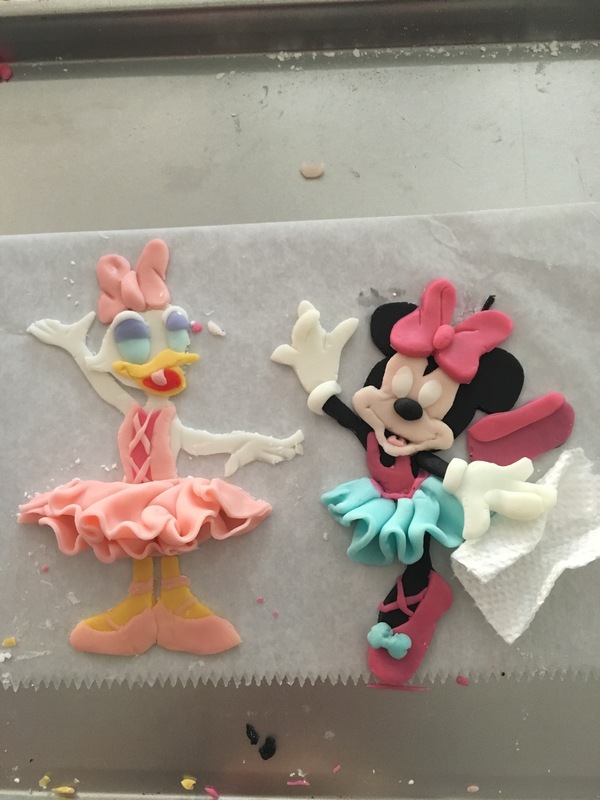 I didn’t take a lot of progress pictures of my fondant Minnie and Daisy. I really have to do a blog post on how I make my characters at some point. I’m just usually in a rush, so I just try to get things done. The first thing I did was make my sketch, of course! 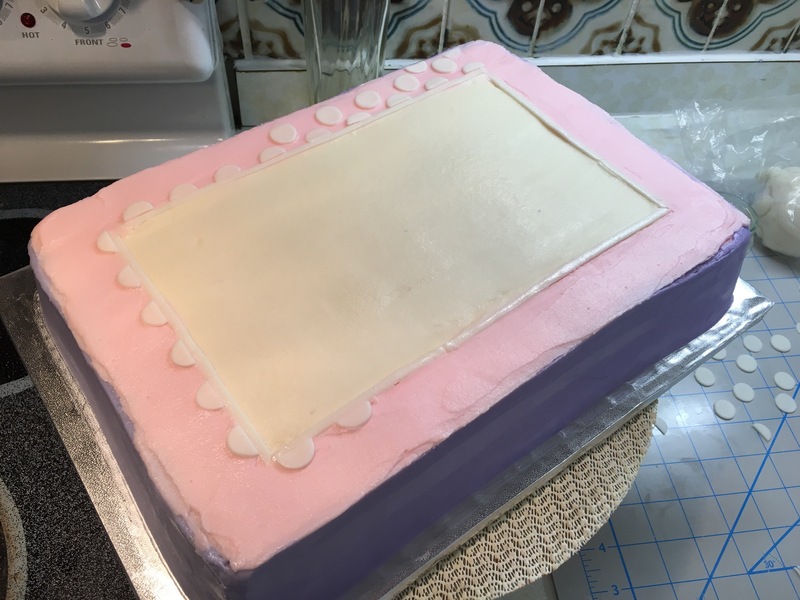 With it being only a 9″ x 13″ quarter sheet cake, I was limited on the amount of space, so I had to come up with something that was designed well enough to fit everything that we wanted into the cake. Being limited on space actually pushes you to make a cleaner and better design. I came up with this after looking at some inspiration on Google. I saw something similar, but different, that was an edible image. After that, it was a matter of finding a Minnie and Daisy that would fit my theme. I really love Mickey’s Once Upon a Christmas, and found a screen cap that became my basis for Daisy. For Minnie, I found a different picture on Google images. But it was very much inspired by Once Upon a Christmas. I just had to switch out skates for ballet shoes! 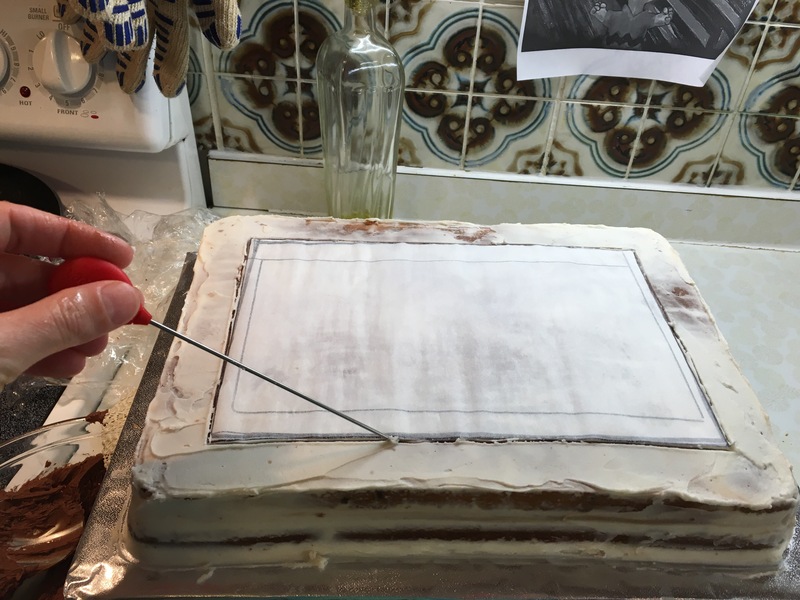 After they were completed to my liking, I figured the most difficult part of my cake was done (boy, was I wrong!). But at least they looked good and were FINISHED. I used my Tappit letter cutters in block lettering and big funky lettering to write our message. I made a big and small “4”. 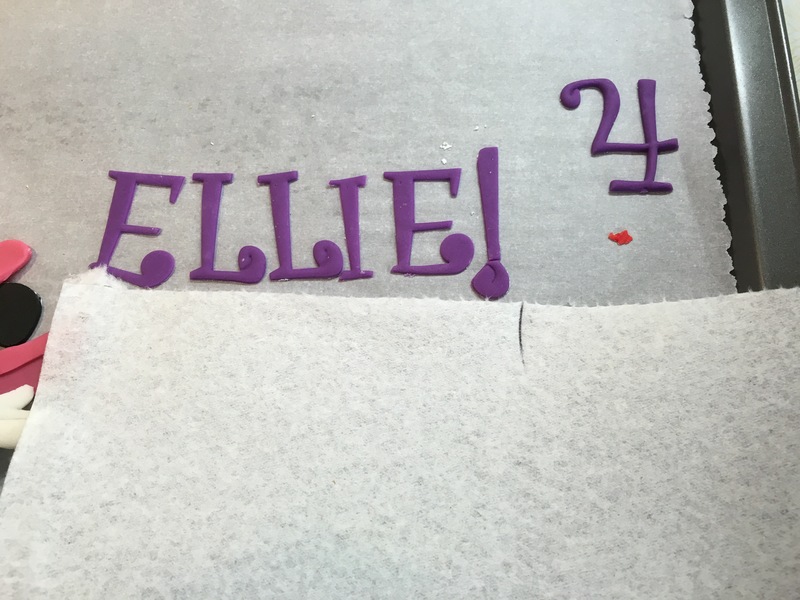 I could have tossed the small “4”, but I am glad I didn’t! I needed it later. I made my favorite Toba Garrett’s decorator’s buttercream, which makes about five pounds of buttercream. 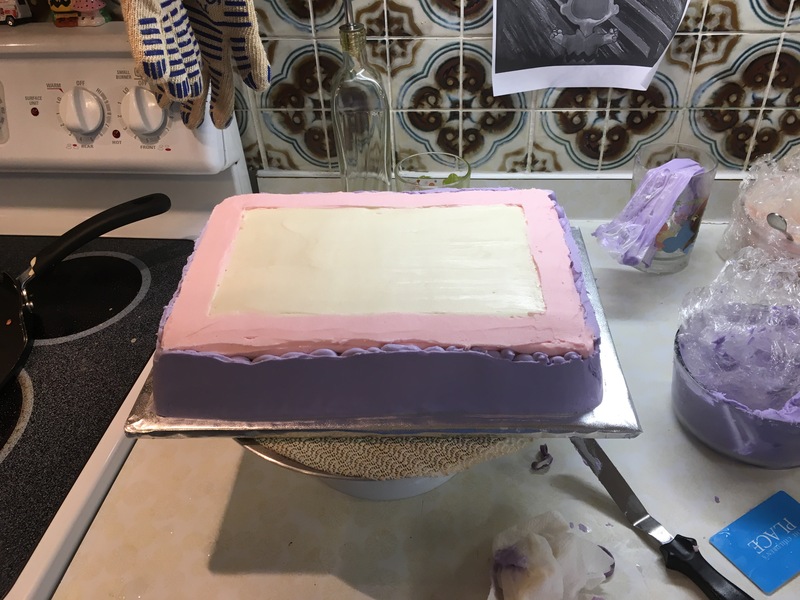 I know that seems like an awful lot of buttercream for such a small cake, but I was going to fill it and wanted to do a good crumb coat. Plus, I get very paranoid about not having enough buttercream! 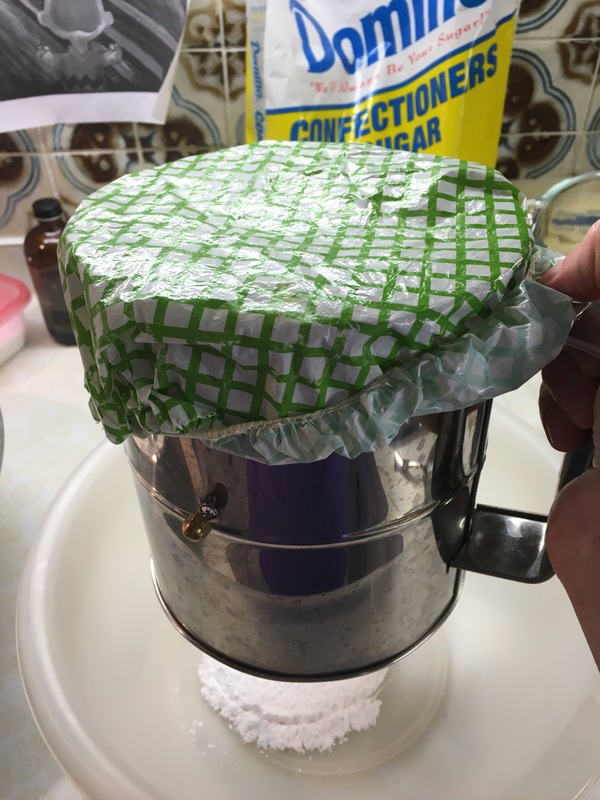 I wanted to show you how I sift my buttercream. First, I weight it. I needed three pounds of confectioner’s sugar. 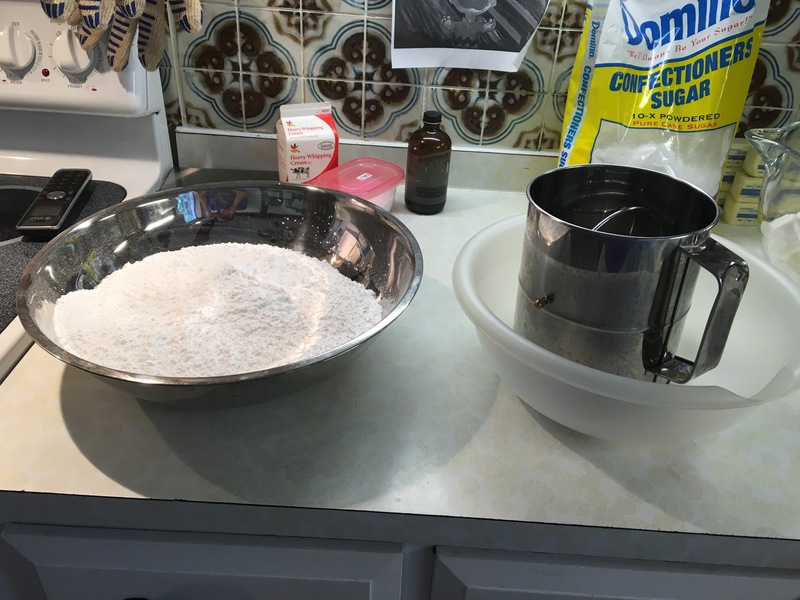 Then I put as much powdered sugar into my huge sifter that I can fit. I cover it with one of these handy covers. They’re meant for picnics to keep insects off of your food, but using them for this has been a life saver! I get to sift quickly without powdered sugar flying all over the place. I make a big enough mess as it is! To make that pink frame, I traced my pan onto a piece of paper. Then I figured out how big it could be to allow for my message and my characters. 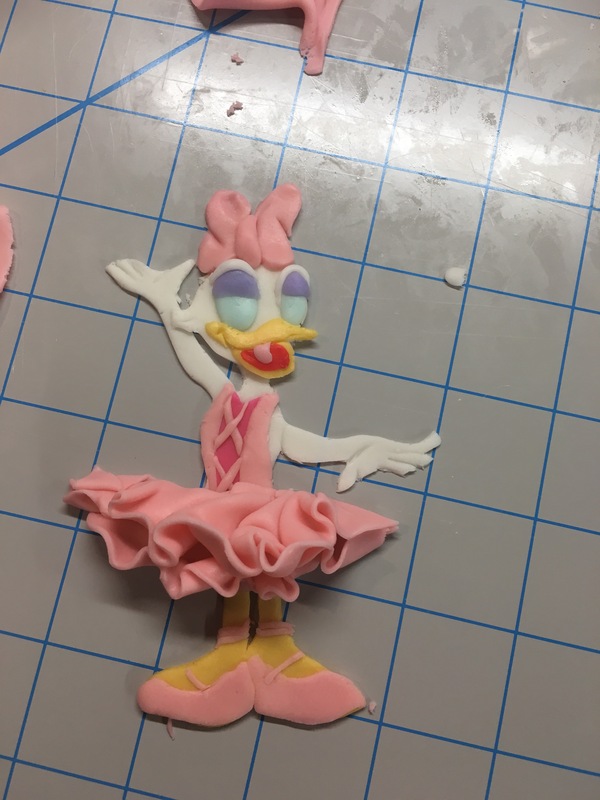 I used this as a guide to make a line out of fondant from my clay extruder so the lines around the frame would be just-right. Then I cut out my rectangle. 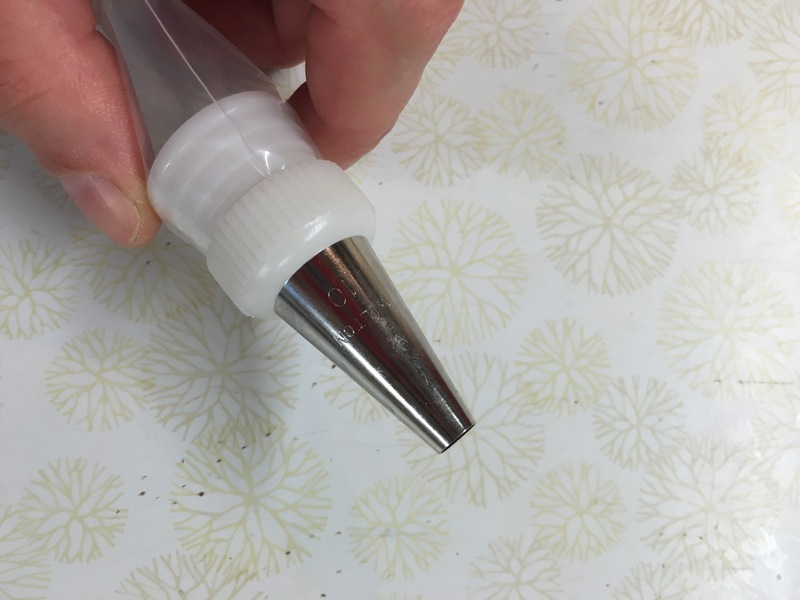 After filling and crumb-coating my cake, I centered my guide on the cake and used my cake tester to draw a line around my piece of paper. To make the process of doing a tricolor cake easier, I knew I wanted to start with applying all my buttercream with my number 10 tips. Luckily, I have a bunch of them from when I made a camouflage cake. It makes it so much easier, rather than having to clean them after each color. And then they’re ready if I need to use that color with that tip again. The buttercream that I made comes out to about 9 cups of buttercream. I measured about 2.5 for the pink and 2.5 for the purple. I used AmeriColor pink (very small amount!) for the pink. 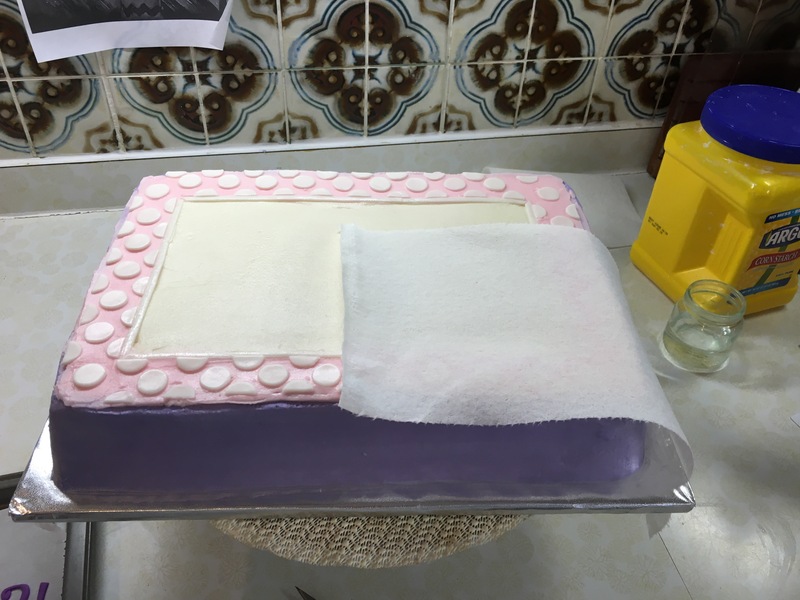 And AmeriColor Violet, Wilton Purple and a dash of AmeriColor pink for the purple icing. The amounts and mixing of the colors are all a guessing game. I used couplers this time so I could switch out the tips for the pink and purple borders with ease. I fill my bags by putting them in cups. The cups hold the bag open so I can add my buttercream easily. For years I didn’t do this, but I am sure glad that I do that now. 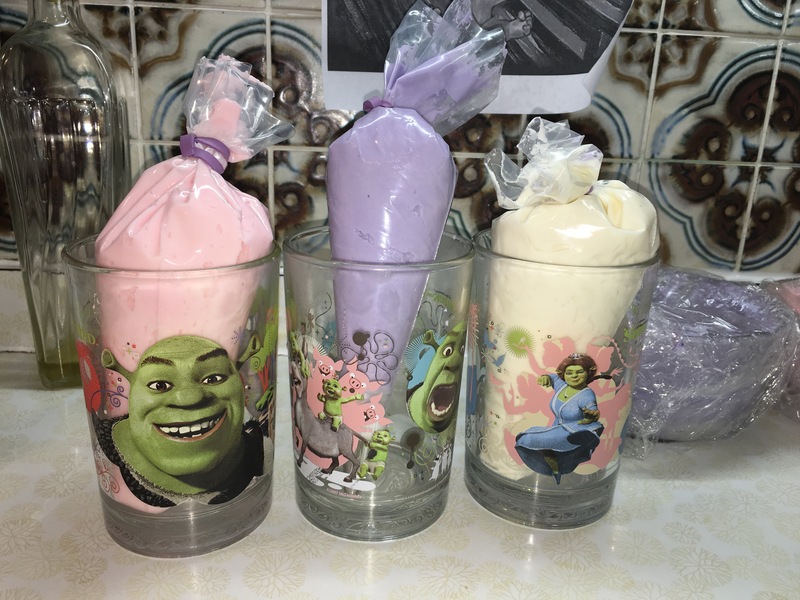 And, BONUS, it means I get to break out my McDonald’s Shrek cups, which bring me so much joy. I sealed them off with my bag ties. See more on how to fill your pastry bags easily here: http://www.yourcupofcake.com/2013/09/cupcake-piping-tutorial.html. Next it was all about filling in. I traced the rectangle with white. Then I traced it with pink. Then, trying to be neat, but knowing it would get smoothed, I filled in the pink area. Then I filled in my white area.I used back and forth motions, trying to keep it even. I tried to get them basically smoothed with my spatula, knowing I would go over them again later. Next, I went up and down the sides with my purple. I knew it would be too much, but when you take away the icing as you smooth, the result is really great (more on that later). Above is what I would call the FUGLY STAGE. This cake with fugly for quite a while. I smoothed it with a clean spatula. Then I went over it again with a clean plastic gift card. 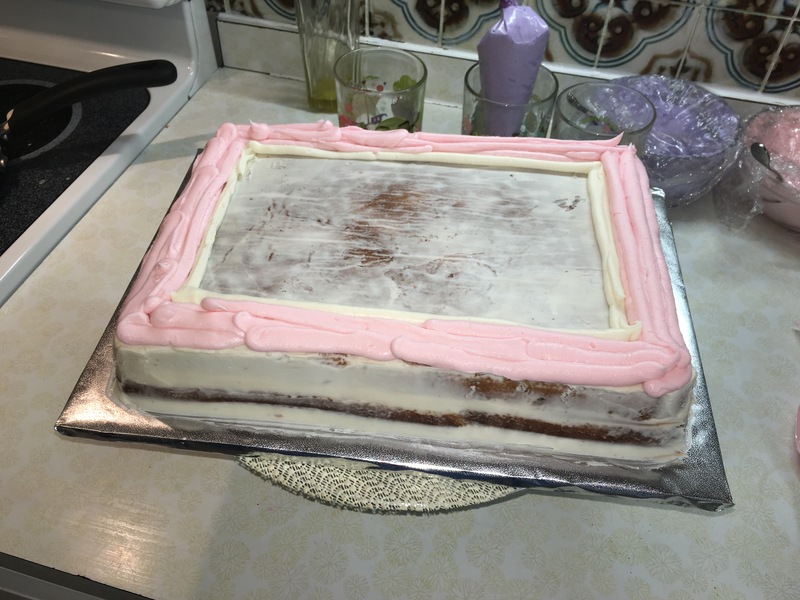 I scraped a lot of extra icing off. 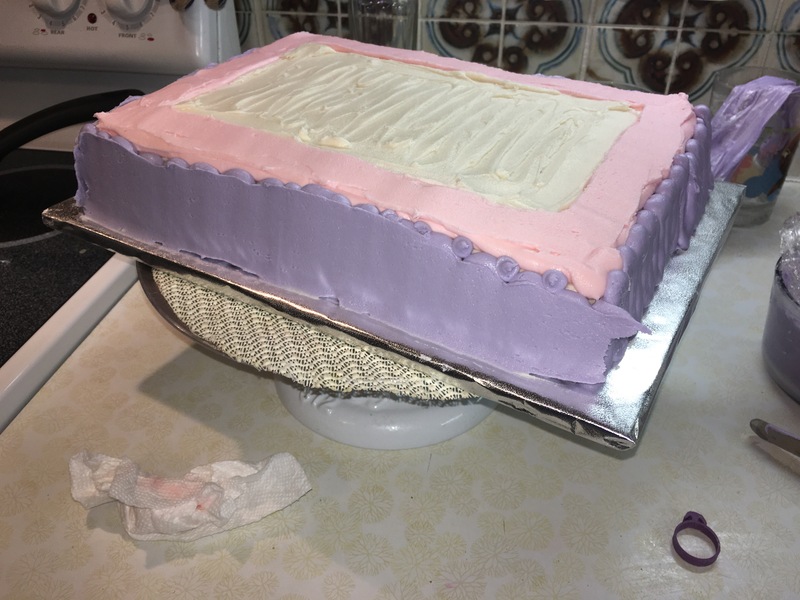 I was able to use salvage the extra buttercream for the bottom border. 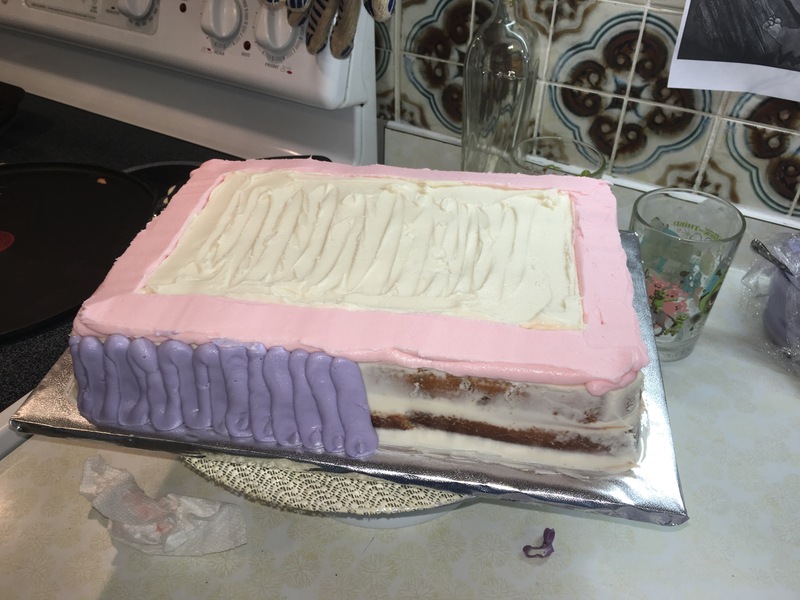 It’s so much easier to take away icing than it is to add icing! This is how it looked when I was completely done smoothing it. Or at least I thought I was done. I put it back into the fridge for a little while so that the buttercream could crust over. Then I took it out and began smoothing it with my Viva paper towel. Be careful to use the SMOOTH SIDE. 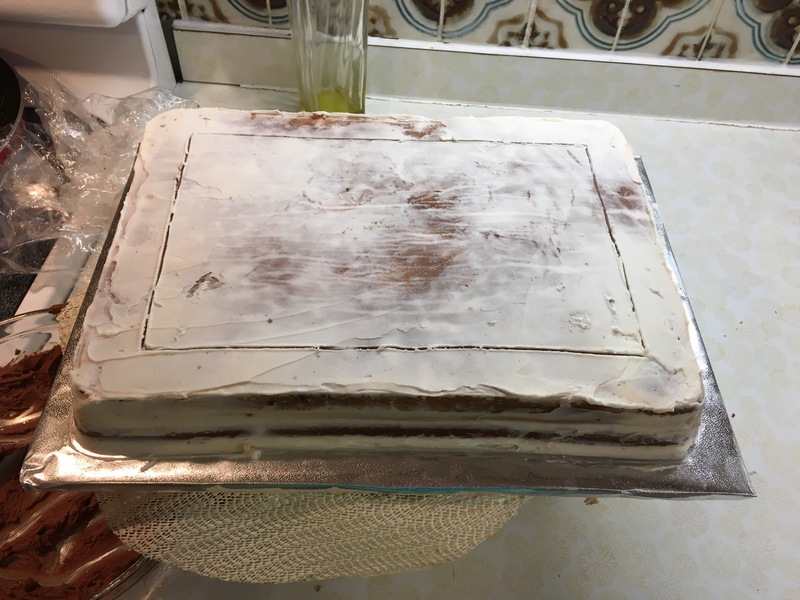 I noticed that there were some spaces on the side that weren’t flush with the top of the cake, so I used my extra icing to fix those spaces. 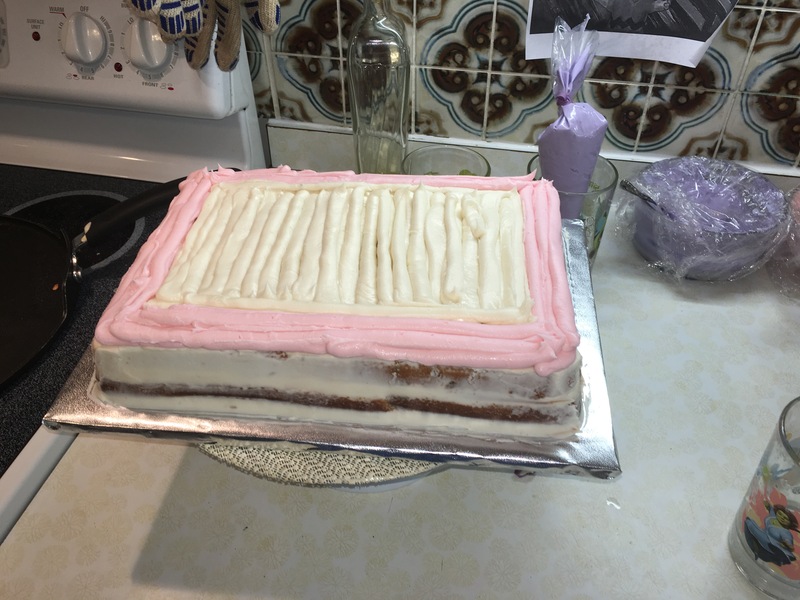 I also put on another layer of white and pink icing. I used every bit of white that I had! 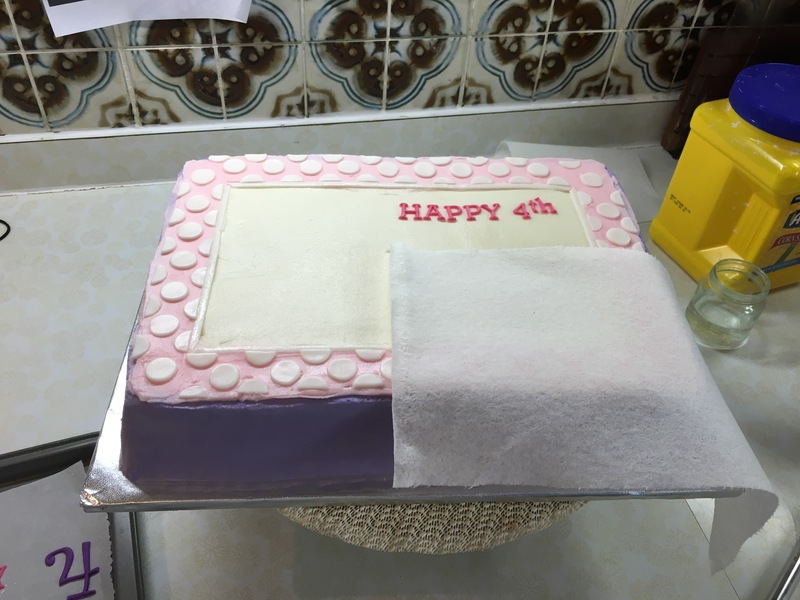 I got a bit of the case of perfectionism with this cake because Rachel is such a loyal customer! I wanted it to be perfect. I spent way too much time making it super smooth. 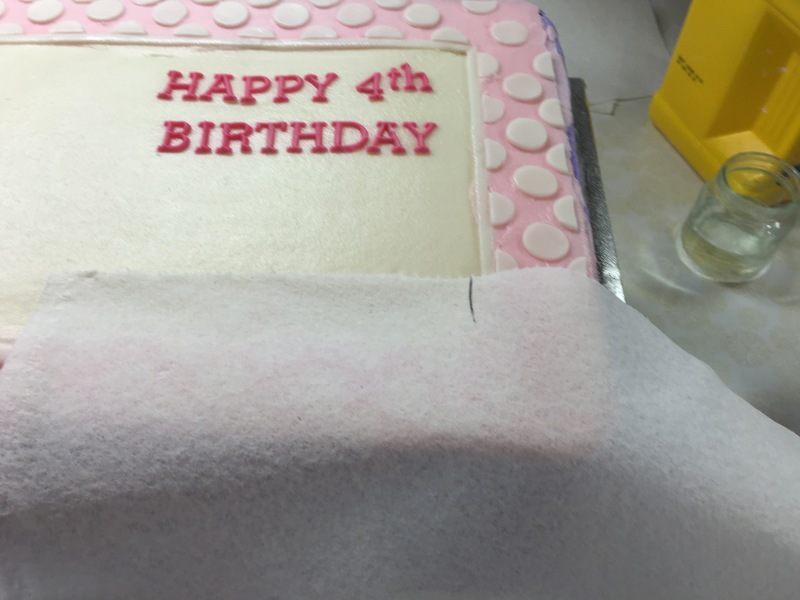 When I was FINALLY finished fiddling with the buttercream, I added my fondant lines and adjusted them until they were correct. Then it was time to start in on the polka dots. Since I didn’t have a lot of space, I went with my smallest circle cutter. This part was just a bit tedious, but it was worth it in the end. I used my X-Acto knife to cut some of them in half for around the “frame” and around the edge. I went around the inside edge first. Then I started the middle, full dots and then the outside dots. After that I wanted to add my words to the right side. I used a paper towel to help me keep my lines straight. I didn’t end up using the large “4” because there just wasn’t enough space. I am glad I didn’t toss the small “4”! 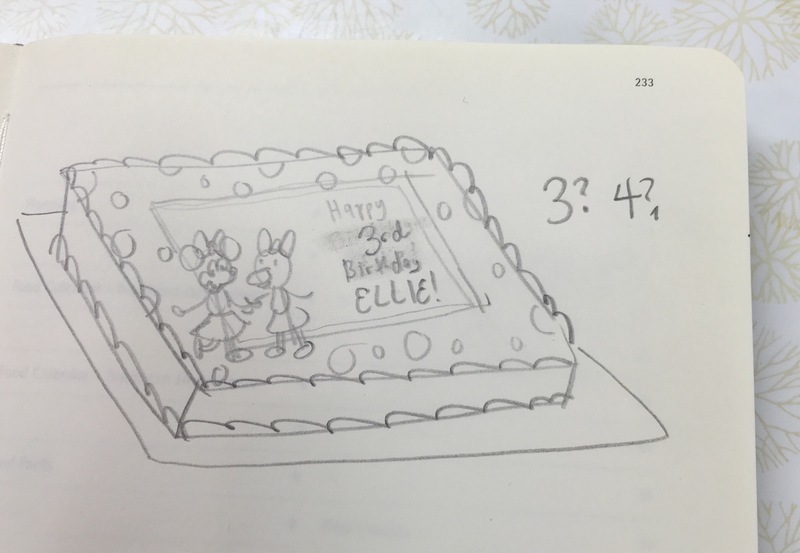 I measured “ELLIE!” to make sure that I would place it correctly. I really should always do this. I placed it as right justified as I could. Then I added the last of the letters. In retrospect, I would have nixed the exclamation point so that everything fit better. You live and you learn! 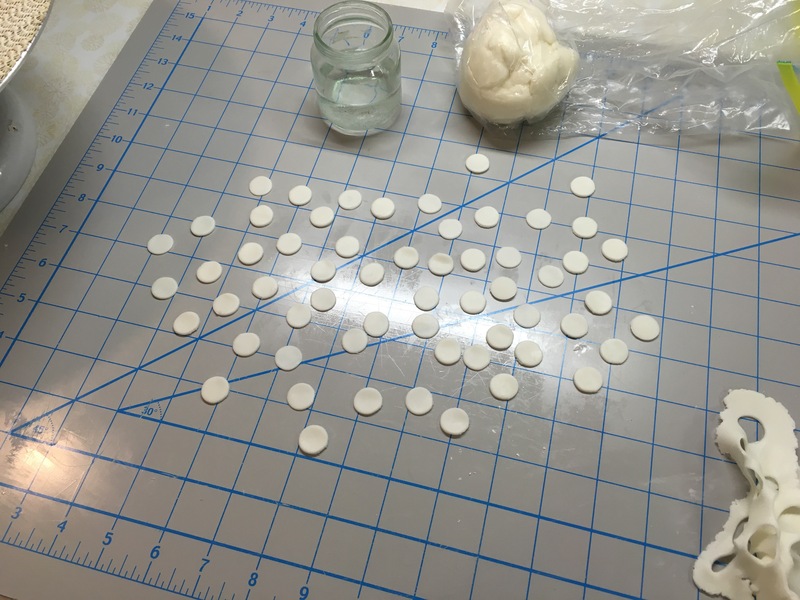 I switched out my number 10 round tips for my number 18 star tips for my borders. I tried something different than I usually do up top and did a sort of swirl-thing. Then for the bottom, since I was limited on space, I did a regular shell border. I realize that I wasted my time doing the half circles around the outside edge since they were completely covered by my border. D’oh! Oh, well. This (above) is how it looked when it was finished in my kitchen. I had to wait until the next day to take my good picture. I wait until the light is good in my dining room, and then I set up my Bake Drop by Sugar High, Inc. I find it so hard to take pictures of sheet cakes. I hate the shadows that I get when I take my pictures, but I don’t want to invest in photography equipment like reflectors… Not yet, anyway. Here’s how it turned out! I will always wish that I got a backdrop sooner, though we really didn’t have room in our old house. 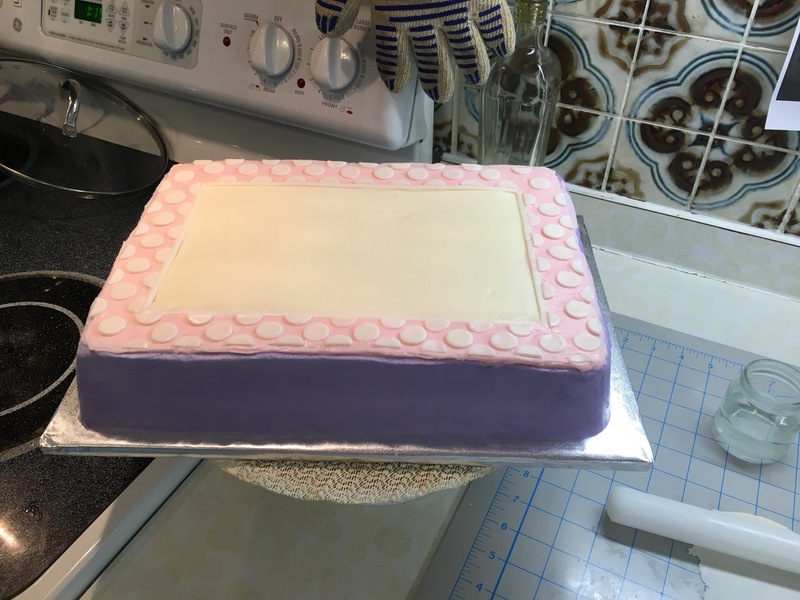 For more on the techniques that I used in this blog post, I really suggest Corrie Rasmussen’s class, The Perfect Birthday Cake on Craftsy. I’ve developed my own style, I think, but a lot of the basic skills that I used are discussed in Corrie’s amazing class. I am relieved to be finished my last client cake of the summer. It has been quite a humid one and I am eternally grateful to my husband for installing the air conditioner that helps cool our kitchen and dining room, where I do all of my work. It made a huge difference! And apparently it really IS my year for sheet cakes because Rachel has booked another sheet cake for her son in November! I’m excited for the theme – dinosaurs – because I have yet to make a dinosaur cake.